Q: What is a podcast? A: A podcast is a portable, on-demand radio show. You can listen on your phone, tablet or computer whenever you want. Q: How many people are listening to podcasts? Q: How much does it cost to listen to a podcast? A: Most podcasts are free to listen and subscribe to. A few accept donations or charge a fee, but the vast majority are completely free. Q: How do I listen to a podcast? A: You can listen with any podcast app. The most common is Apple Podcasts (formerly part of iTunes), which is a native app. This means it comes pre-installed on iPhones, iPads and other Apple devices. For Android users, Google has launched Google Podcasts. It’s still a work in progress. Android and Apple users alike can also use third party apps likes Spotify, Stitcher, TuneIn, iHeartRadio, and more. Q: Who can create a podcast? How will my podcast stand out? 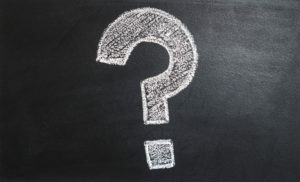 A: Truthfully, anyone can create a podcast with a microphone and an Internet connection. However, professional sounding podcasts will be noticed. Remember when YouTube first arrived? We’d watch anything. As technology evolved, viewers lost their appetite for poor production. The same is true of podcasts. The number one cause of podcast tuneout is poor quality audio. Lower quality audio necessitates exceptional content to keep listeners. Q: What advantages do podcasts have over blogs, videos, and other media? A: Intimacy. Social media, blogs, videos, and other content should all have a place in your overall marketing strategy. Podcasts are unique, however, because of the intimacy of audio. In 2018, advertisers bombard us with messages across multiple screens. Every visual message is trying to scream above the noise. However, we consume audio differently. People listen to podcasts in the car, at their desks and around their houses. Your show is only competing with other podcasts, music and traditional radio. That playing field is much smaller. Audio itself is more intimate than video. Remember the heyday of local radio? Think about the morning show you listened to each morning. Remember the wisecracking DJ you heard on the way home. You felt like you knew him or her. They were a familiar voice in your car or at home, often your only companion. There’s a psychological bond there, and successful podcasters can achieve the same thing in 2018. Q: What’s the advantage to having podcast subscribers? Once listeners subscribe to your show, each new piece of content is automatically sent to them. They don’t have to bookmark a page to return to a blog. You don’t have to hope Facebook’s ever-changing algorithm will show them your post among a sea of political rants and first-day-of-school pictures. Q: Can you make money podcasting? A: Yes, but not right away. The more immediate benefit of podcasting is to create another touch point for your audience. If you could have a free billboard on the interstate, would you? Yes, because you want to be were your audience and customers are. With 50 million monthly podcast listeners, this is your chance. Podcasts are a great tool for brand awareness. Some of the larger podcasts (with tens of thousands of downloads) such as The Daily and Pod Save America can get big national buys from companies like ZipRecruiter and Squarespace. You won’t get to that level overnight. Once you establish yourself, you might be able to get a smaller sponsor in your city or in your area of expertise. The most effective type of podcast advertising comes from a traditional radio idea, the “live read” or “endorsement.” A host reads about a product or talks about his or her own experience with it, and the authority in the voice and relationship with a listener can be leveraged for credibility and success. Additionally, podcast revenue DOUBLED to $314 million in 2017, and that trend may very well continue. Would you rather get in on the ground floor or play catch up? What are some misconceptions about podcasts? 80% of people say “I don’t have a podcast app.” Not true, as referenced above. 30% think podcasts are only educational. Truthfully, podcast run the gamut from true crime to audio drama. 50% think podcasts are too long. Some are as short as 10 minutes. 47% think podcasts cost money. Again, most are free. 62% think podcasts use too much of their mobile data plans. Audio uses far less data than video. Many people download podcasts on their home or work WiFi network then listen on-the-go. 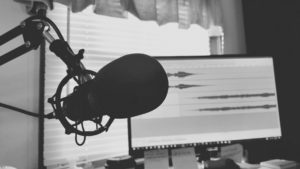 What’s the relationship between traditional radio and podcasting? Corporate Consolidation – Several large companies bought the majority of radio stations in this country. This started with the relaxed ownership caps of the Telecommunications Act of 1996. Several large companies bought up hundreds of stations in markets all over the country, which led to redundancies, layoffs, and homogenization of content. Voice Tracking – This was radio’s dirty little secret for a long time. As technology improved, DJ’s in one city could record a show that aired in another. I saw both sides of this coin, starting with when I was laid off due to budget cuts in Detroit. My show was replaced by a woman in California who didn’t know how to pronounce Michigan streets and towns. She’d never seen snow. Conversely, when I was in New Orleans, I frequently helped friends in other cities cover shows when their local people were sick or they were short-staffed. From my studio in the Crescent City, I did shows for Colorado Springs, Madison, Greenville and Detroit. I could “sound” more local by skimming the websites of the local TV stations, but I wasn’t physically there to experience the town. It made the generalization that listeners hated all DJ’s. Actually, they would tune-out DJ’s with weaker content. Management overlooked the idea that stronger disc jockeys would keep listeners around. Being a jukebox with less personality was fine in the early days of the PPM’s (Portable People Meters). Then, services like Pandora and Spotify came along. Audiences could create their own jukeboxes with their own music and radio had lost what differentiated itself – its personality. Q: What does that mean for the future of podcasting? A: In July, the world’s largest convention of podcasters came to Philadelphia. There were over 2,000 attendees. Every major radio company was also there. The “big boys” see the power and value of podcasts. They want to get involved, and they are now playing catch-up. How can Jag in Detroit help my podcasting efforts? 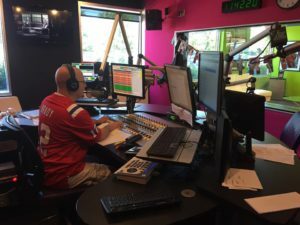 My experience in radio has taught me about audio content. I create daily radio shows, edit audio and coach up-and-coming talent. A podcast with professional-grade audio content and production will help you stand above your competition. It will also provide an additional touch point with your audience. It will build loyalty among your clientele.